One in five Brits believe lightsabers are real. Science or Fiction? While a number of today’s science innovations which most of us take for granted, like airplanes, automobiles, computers or space flight, have been outlined by imaginative science fiction writers before they were possible, it seems there’s a concerning blurred line between what has actually been made possible by science and what is of the realm of science fiction in the minds of some Britons. 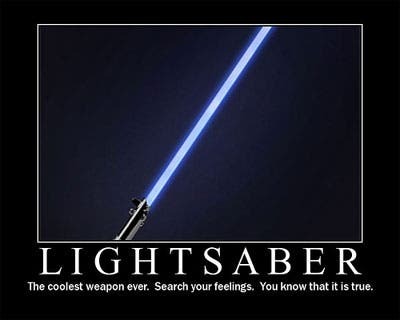 • More than a fifth of adults believe light sabers exist. • Almost 25 percent of people believe humans can be teleported. • Nearly 50 percent of adults believe that memory-erasing technology exists. • More than 40 percent believe that hover boards exist. • Almost one-fifth of adults believe they can see gravity. “We commissioned the survey to see how blurred the lines between science fact and fiction have become,” said Pam Waddell, director of Birmingham Science City. “While films and TV can be acknowledged as creating confusion, it is also worth highlighting how advanced science has now become, and many things deemed only possible in fiction have now become reality or are nearing creation due to the advancements of science,” she added. If you’d like to test your knowledge of science fiction and fact, take this very short Birmingham Science City quiz, and then compare your answers to how 3,000 others did. National Science and Engineering Week runs through March 20 in the U.K.